Hall of Forty Pillars) built by Shah Abbas the Great (A.D. 1588-1629). The wall paintingsat the Chihil Sutun in Isfahan are the best preserved of Persian mural decoration; they include intriguiging narrative paintings of historical subject matter in addition to the conventional literary themes and scenes of courtly life. 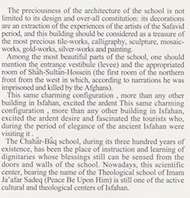 Babaie, S. (1994) Shah Abbas II, The conquest of Qandahar, the Chihil Sutun and its wall paintings. Muqurnas pp125-142. It is a town situated on a plain; it has an agreeable climate, and wherever one sinks a well to a depth of 10 gaz (about 23 feet) very cold and good water flows out. The city has a strong and high wall, with gates and fortifications, and on all the walls there are battlements. Inside there are streams of running water and fine and lofty buildings; in the centre of the city is the great and magnificent Friday mosque. They say the walls of the city are three and a half farsangs (over twelve miles) in length. The interior of the city is uniformly prosperous in appearance and I did not see a single building in ruins. I noticed many bazaars and in one of these, which was that of the money-changers, there were 200 men of this profession. Page 92 of his Safar-Namah ('Book of Travel'). 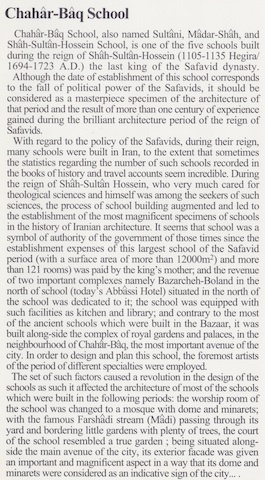 cited in, Lockhart, L. (1939) 'Famous Cities of Iran'. Walter Pearce & Co. Brentford. 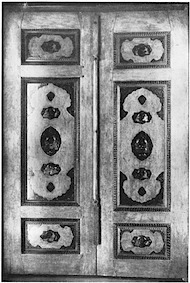 Khusrau was a celebrated traveller and Ismaili propagandist (whose teachings influenced Hasan-i-Sabah, the founder of the Assassins). 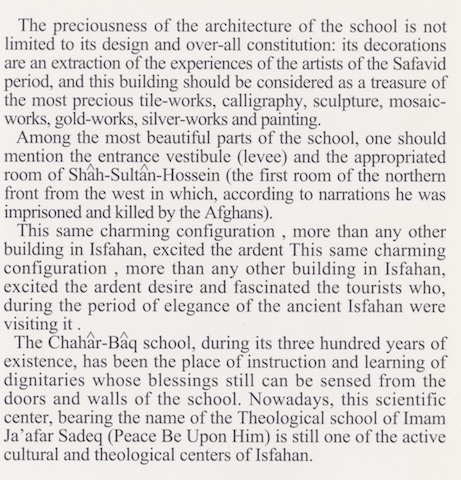 This is not as well known as the more obvious sights, so I'll put up some information taken from a booklet called, 'Chahar-Baq School, published by the Iranian Cultural Heritage Organisation (Isfahan Province). 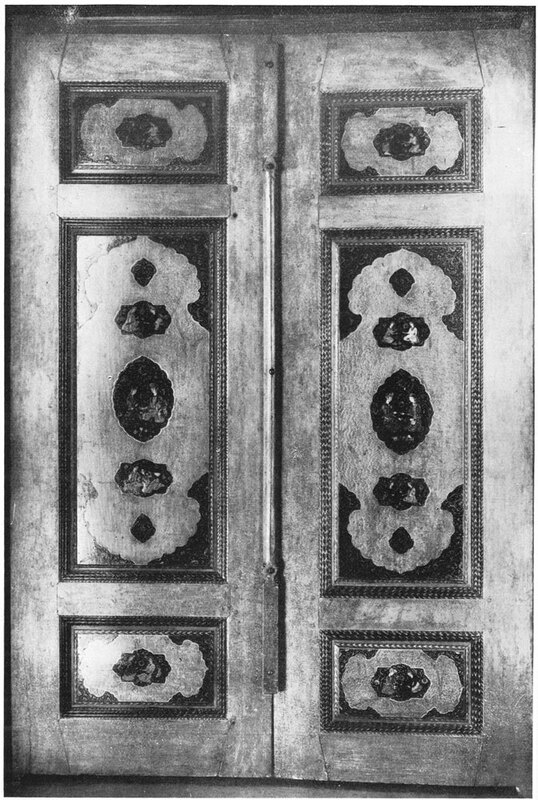 Images accompanying the book are in the folder below labelled, Chahar Bagh Madressa. 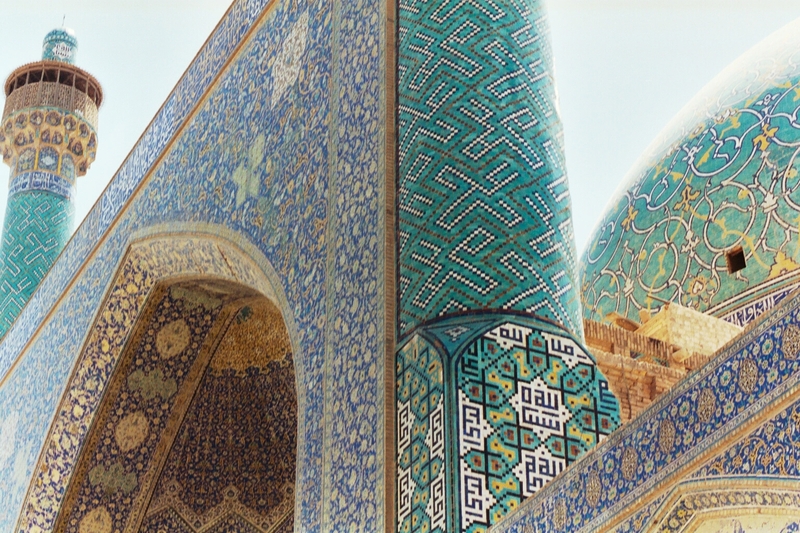 In 2002, we flew from Mashhad to Esfahan and then took the onward flight to Tehran. There are also intercity buses between Tehran and Esfahan. Between Qom and Esfahan is a distance of 144 miles or 232 km, this suggests that a car/taxi trip between the two should be practical, for those people who are going to Qom anyway and who perhaps want to visit Mashhad from an airport other than the one in Tehran. Rail to/from Tehran - there is a daily train (takes 7.5 hours). 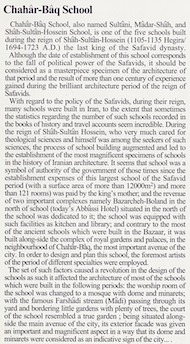 Esfahan has a lot of sights within the city and the city is not very large, so you can see quite a lot of impressive material in a relatively short period of time. 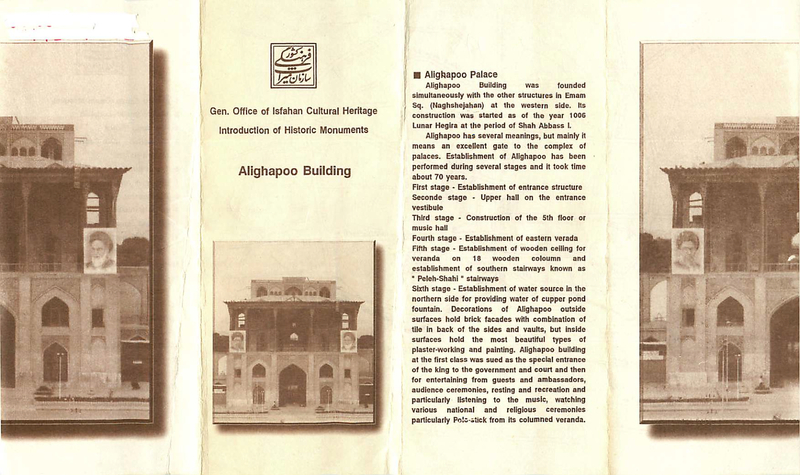 For example within Imam Square (also known as Naqsh-e-Jahan and Meidan Shah) you can find the Masjid Imam, Ali Qapu Palace and the Sheikh Lotf Allah Mosque. Together with the associated shopping around the square, this ensemble can easily take a full day, depending on how much you want to haggle when shopping. If one of the carpet salespeople tempts you in, then that can take away a good portion of the day. 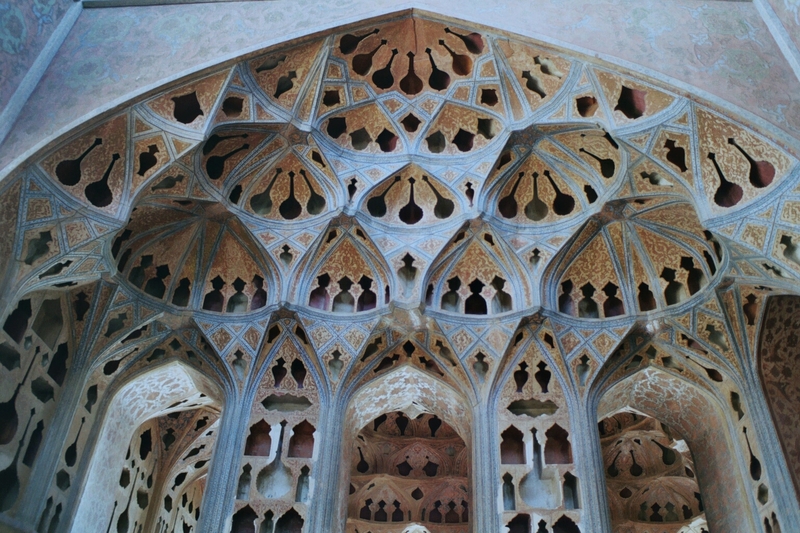 For the time pressed tourist I would recommend giving priority to Esfahan over Shiraz.